the music he creates today. With original lyrics created to be entertaining or based on life experiences, a little bit of reggae and crossover flavor and a whole lot of variety, UZMAN is an artist who has a little something for everyone. 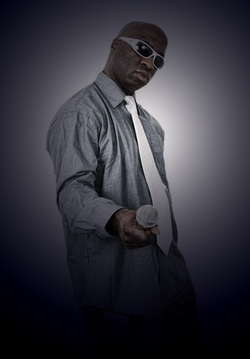 In his earlier years UZMAN was a member of several rap groups, and in the early 90’s even received national exposure while a member of the group Project Underground, for the song “Funky Bogle” when they performed it for live on television show "Electric Circus". This song was released on a EP titled "On The Move of Elevation". Year 2000 he returned with few singles that rocked stages and radio shows. After another hiatus gap UZMAN returned yet again in 2009 with a self-produced single "Bailout" reflecting on the world recession and had been commended on the choice of lyrics, stage performances and music video visuals. This was released on an EP "The Buzz Creator" which received some national college radio charting. Realizing that he had to modernize his delivery style and step up on production, UZMAN aquired award winning producer Derek Brin to reproduce his BANA TIME song which turned out immediate positive feedback. UZMAN also was directed by Canadian industry heavy players to producer JAHRONOMO INC who had done some work for D.O of Art Of Fresh. UZMAN and JAHRONOMO collaborated on "WINE AND GRIND"
EPMD, Run DMC, Notorious BIG and Shaba Ranks.